Weekend Getaways Near Atlanta – North Georgia: About 90 minutes north of the congestion of Atlanta is one of the best-kept secrets of the South: the North Georgia Mountains, and a lovely and comfortable inn – Beechwood Inn. This region is a mecca for outdoorsy-foodie types with an abundance of options for hiking, watersports, zip-lines, farm to table dining, wine tasting and more. Our location at the southern-most end of the Appalachian Plateau makes it a pristine spot for nature lovers, while our small mountain towns overflow with character and charm. In addition, we offer a burgeoning wine industry with more than thirty wineries. Need a special place to visit not too far from home? Come celebrate the season of awakening in Rabun County Georgia, located in the southern Blue Ridge Mountains just a 90 minute drive from Atlanta. Beautiful mountain valleys, cool springs, roaring waterfalls, lush forests, shimmering lakes, famous hiking trails, a picturesque gorge, and a wild and scenic river. And stay at a luxurious award winning inn known for its serious food and wine credentials. As spring stretches, yawns, and finally stirs, all the facets of cultivation come to mind in the mountains of northeast Georgia. The rich ancient earth pulses with life as bud and blossom begin to celebrate the season of awakening. Rabun County Georgia, located in the southern Blue Ridge Mountains offers the Best Weekend Getaways Near Atlanta – Beechwood Inn. 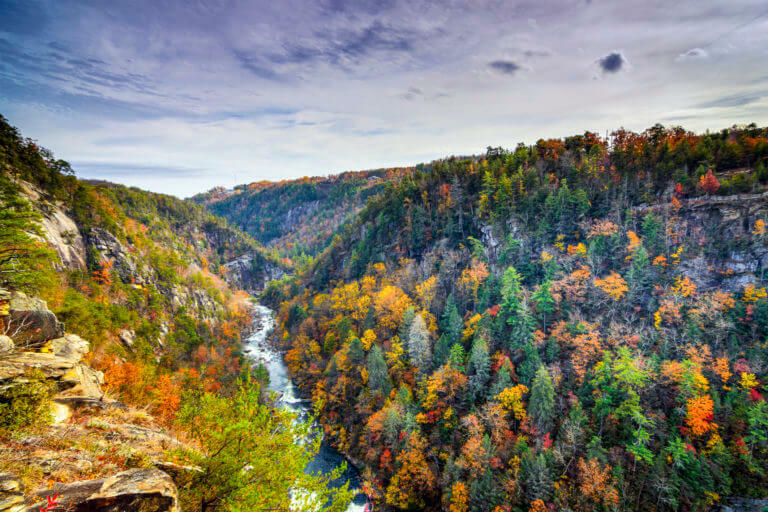 Beautiful mountain valleys, cool springs, lush forests, shimmering lakes, famous hiking trails, a picturesque gorge, and a wild and scenic river. Nestled at the southern tip of the Appalachian Plateau in very corner of Northeast Georgia, Rabun County GA is a convenient drive from the major metro areas of Atlanta, Augusta, Asheville, Greenville and Chattanooga. It is a convenient hub for day trips to other nearby places and attractions in the Northeast Georgia Mountains and Western North Carolina. The villages of Rabun County celebrate the renewal of their mother land with festivals. The arts abound here as the talented painters, weavers, potters, and jewelers capture the colors of the earth in objects both beautiful and practical. The music of the mountains can be heard along with laughter and catch-up conversations as people stroll and shop and indulge in festival foods. Because of our number of chefs featuring local ingredients and our many local farms, gardens and orchards, Rabun County was designated by the State Legislature as the “Farm to Table Capital of Georgia.” Our area also boasts three of Georgia’s “Top 10 Farm to Table Restaurants” including “Beechwood Inn,” “Fortify Kitchen and Bar” and “Lake Rabun Hotel.” In nearby Clarkesville is “Harvest Habersham” also a “Top Ten Pick.” Wow, great dining. Weekend Getaways Near Atlanta – North Georgia: As spring invites you out, cultivate your sense of exploration and adventure. You will celebrate the season on all levels in Rabun County. Pick up some home-made bread. In Clayton, visit Fromage restaurant and purchase some fine aged cheese for a picnic in a vineyard. Of course a bottle of wine can be readily purchased at the vineyards to round out your mid-day ramble. After your picnic, check in at the Amara Center and cultivate your inner peace. The state of the art medi-spa offers ultimate relaxation and pampering and features natural products. Spring evenings in Rabun County offer experiences from the simple to the sublime. Who can resist a mountain sunset as the air cools and a billion sparkling stars come into view. The sheer expanse of sky and the peace of dusk are as renewing as the afternoon smell of sweet spring meadows. Cultivate your mind: watch first release movies at Tiger Drive-in, our home-grown center for local culture. Before each show the grill is open for dinner offerings. There are also special event nights such as “Hot Rod” night – or local competitions like the “Tiger Idol Contest”. Pets are welcome so the whole family can enjoy an evening of casual fun. Rabun County is also home to three state parks including Tallulah Gorge, the deepest gorge east of the Mississippi, Black Rock Mountain State Park, the highest state park in Georgia and Moccasin Creek, offering access to Lake Burton and nearby waterfalls. Weekend Getaways Near Atlanta – North Georgia: Rabun County also features 4 top rated local wineries each producing award winning wines. These include Tiger Mountain Vineyards, Stonewall Creek Winery, 12 Spies and Noble Wine Cellars. Beechwood Inn also features its own house-made Georgia Wines. For foot tapping fun under the stars, the Tallulah Falls town square is the host for Saturday night Blue Grass jams all summer. Bring your fiddle and join in! Or visit our newest music venue the Nichols Center/Blue Ridge Music Academy, just a short walk from downtown Clayton. Each season creates an exceptional setting to discover all that Rabun County has to offer. From the 4,969 foot summit of Rabun Bald in the county’s northern end, to the 1,200 foot deep Tallulah Gorge at its southern end, you’ll discover majestic mountains, shimmering lakes, roaring waterfalls, cool springs, lush forests, award-winning vineyards, roadside stands, festivals, trails, arts and antiques, history, a wild and scenic river, and more, all waiting to be explored. The land, the culture, and the people of Rabun await you. Come to relax. Come to be thrilled. Come to enjoy! Come to fall in love.